“Then Lamech said to his wives:“Adah and Zillah, hear my voice; wives of Lamech, listen to my speech! For I have killed a man for wounding me, even a young man for hurting me. If Cain shall be avenged sevenfold, then Lamech seventy-sevenfold.” Genesis 4:23-24. The Antichrist is described as a man of dread or terror. 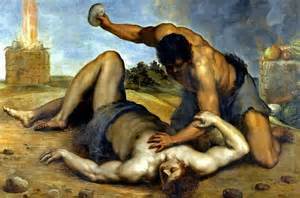 It was because of the fear of Cain no man would dear challenge him. Here is an example found in Genesis 9 listen to what God said about Noah and his sons and hos the animals would fear them. “So God blessed Noah and his sons, and said to them: “Be fruitful and multiply, and fill the earth. And the fear of you and the dread of you shall be on every beast of the earth, on every bird of the air, on all that move on the earth, and on all the fish of the sea. They are given into your hand. 3 Every moving thing that lives shall be food for you. I have given you all things, even as the green herbs. Genesis 9:1-3 So in the case of Cain, when they would hear his name the first thing that could come to mind is fear, his name was connected to his character of dreadfulness, or blasphemy the mark was the name of the man, dread is coming. As an example of this mark and terror that was placed on Cain, notice what the people are saying about the beast in revelation “Revelation 13:4 And they worshiped the dragon which gave power unto the beast: and they worshiped the beast, saying, “Who is like unto the beast? who is able to make war with him?” Who is able to make war with him showing he was a man to fear.